Day lily. Hemerocallis, which comes from ancient Greek words meaning beautiful day. 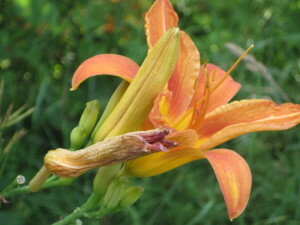 Day lilies are suddenly all over the place in early July. 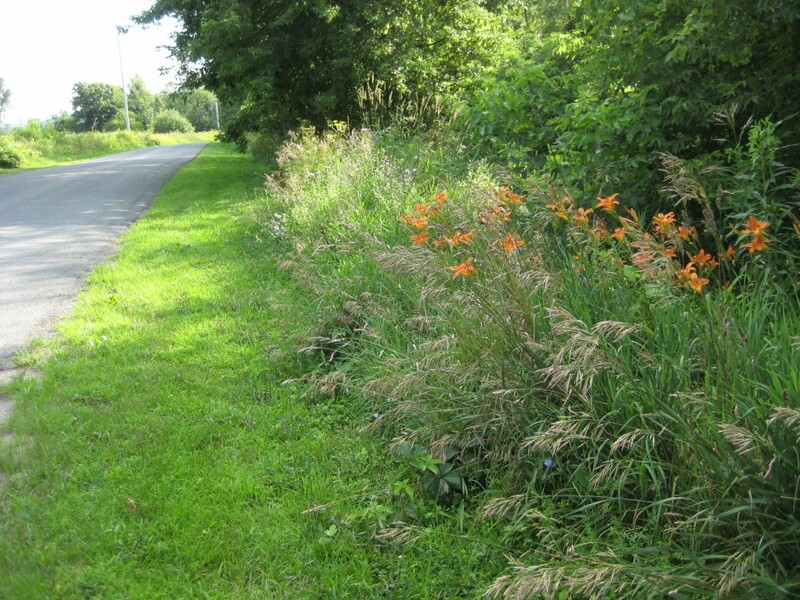 They start to line the roadsides as though waiting for the Fourth of July parades. The orange bursts of petals among the green are a kind of botanical fireworks. 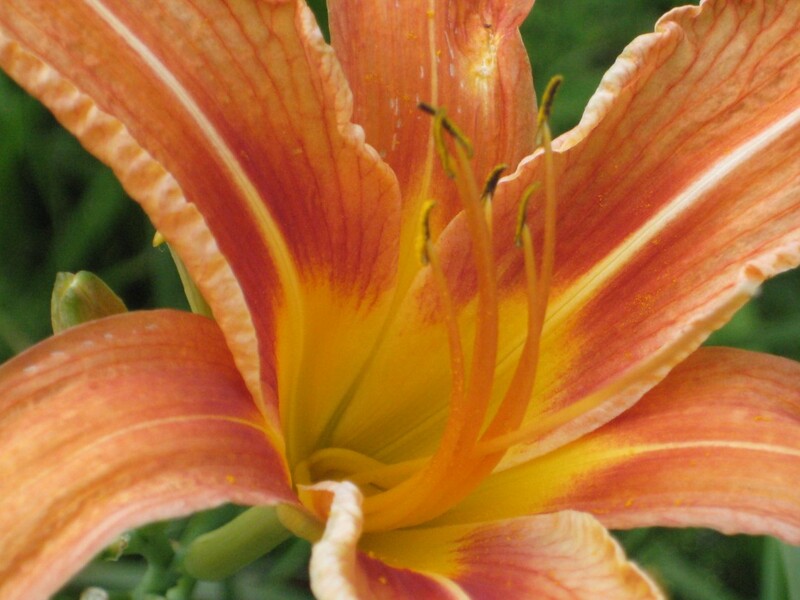 Why the name day lily? If you look on any day lily stalk, you’ll see half-a-dozen buds, each one slightly bigger than the next. With a punctuality that’s pretty amazing, they will open precisely 24 hours apart. So that on one stalk you have, so to speak, the entire schedule for the week. Today Monday’s flower is open. Tomorrow Monday’s blossom will be but a withered husk, and Tuesday will be in full bloom. (There’s a life lesson in there somewhere, I suppose.) And then the next day, Wednesday’s flower will bloom, and so on. Many garden websites sigh over daylilies as the “Perfect Perennial.” From a handful of original species native to Asia, gardeners have developed more than 60,000 hybrids that come in every shade of the rainbow and have curly petals, polka-dotted petals, stripes, swirls, and all sorts of flourishes. They’re easy to grow, drought-hardy, disease resistant…perfect, right? Except we know, don’t we, that nothing is perfect. One tiny little drawback to planting these sweet flowers—they literally taste sweet. The flower buds, long and string-bean-like, are a good wild vegetable. And deer LOVE them. It’s their idea of caviar, or chocolate, or something. Want deer in your garden? Plant day lilies and ring the dinner bell, and you’d better stand back. But still, day lilies thrive along the roadsides. Maybe the original, hardy species grows so thick and fast that the deer don’t make a dent. So I’ve mostly resisted the temptation to fuss with them in my garden. I just let them line the highways and byways, marking the summer days one by one.